Henry, Count of Malta was a Genoese Lord of Candia ( at birth count Enrico de Candia in the Canavese, Piedmont), adventurer, privateer and pirate active in the Mediterranean at the beginning of the thirteenth century. He is known as Enrico or Henrico Pescatore (Pescatore, 'fisherman' in Italian, being a nickname), or Pistore in reference to his fiefdon and family branch of the Normand counts of Prato Pistoia "dei conti de Candia Pistoia" of the House of Candia. The title Count of Malta was created by Tancred of Sicily some years before, for Margaritus of Brindisi and then was taken over by Emperor Henry VI, Tancred's opponent in Southern Italy and Sicily. Henry’s irregular acquisition of the title is attributed to his relationship as son-in-law to the previous holder, Guglielmo Grasso, Henry VI's and then Emperor Frederick II’s admiral, around 1204. Even more dramatic than the fall of the Fatimids was the collapse of the kingdom of Sicily. While Saladin was able to maintain the old system of government, including the exercise of lucrative monopolies, Sicily and southern Italy fell prey to rapacious barons in the 1190s, creating enormous instability in the central Mediterranean. In the face of bitter opposition from most Sicilian barons, the German emperor, Henry VI of Hohenstaufen, invaded the kingdom, which he claimed in right of his wife (Roger II’s posthumous daughter), with the opportunistic support of fleets from Pisa and Genoa. He was only able to enjoy his conquest for three years, between 1194 and 1197, all the while planning a crusade and a war for the conquest of Constantinople. Then his widow Constance attempted, in the year of life that was left to her, to return Sicily to its old equilibrium, but disintegration had begun: the Muslims were in revolt in western Sicily, and would remain in rebellion for a quarter of a century. After she died her small son Frederick became the plaything of competing factions in Palermo, and the barons and bishops on the south Italian mainland seized the opportunity to take over crown lands without serious opposition. He is generous and intrepid and chivalrous, the star of the Genoese, and makes all his enemies tremble throughout the land and the sea … And my dear son Count Henry has destroyed all his enemies and is so safe a shelter to his friends that whosoever wishes may come or go without doubt or fear. Even when pursuing private ambitions, then, the Genoese pirates tried to produce benefits for their mother-city, which was unlikely to abandon them if they were thought to be working in the republic’s interests. Henry’s next venture, his attempt to conquer Crete, followed the collapse of yet another great power in the Mediterranean. 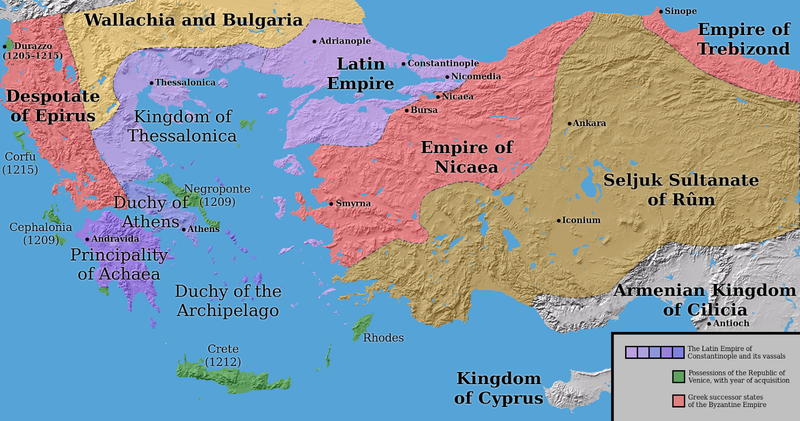 After the death of Manuel I Komnenos in 1180 succession disputes consumed the political energies of the Byzantine aristocracy; these energies were further sapped by a great Turkish military victory at Myriokephalon in Asia Minor four years earlier, from which Manuel had been lucky to escape alive. Italian pirates acquired bases in the Aegean; Corfu fell into the hands of a Genoese pirate who was now free to raid Venetian shipping as it passed through the Adriatic exit. 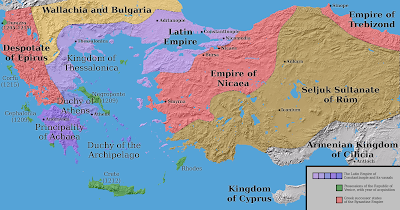 The Pisans and Genoese were keen to wreak revenge on the Greeks for the massacre of their citizens in Constantinople in 1182, which was mentioned earlier in this chapter. One of the worst outrages was committed by the Genoese pirate Guglielmo Grasso, who was in league with a Pisan pirate named Fortis. After raiding Rhodes with impunity in 1187, they attacked a Venetian ship sent by Saladin to Isaac Angelos, the Byzantine emperor; as well as Saladin’s ambassadors it carried wild beasts, fine woods, precious metals and, as a special gift from the sultan, a piece of the ‘true cross’. The pirates killed everyone on board, apart from some Pisan and Genoese merchants, and Fortis gained possession of the relic, which he carried off across the Mediterranean to the rock-girt town of Bonifacio, in southern Corsica, then held by his fellow-Pisans. The Genoese were convinced they had a better claim to the true cross, and raided Bonifacio, capturing both the relic and the town, which they held thereafter and used as a base for their trading operations in northern Sardinia. Western regrets at the attack on Saladin’s envoys were few, for their journey was seen as proof that the Byzantines and the Ayyubids were in league against the kingdom of Jerusalem.